THE Queen's Birthday Honours List for 2015 has been described by some as being rather "top heavy" with politicians and councillors, but as always the list includes some quiet achievers who are deserving of the recognition accorded by the Order of Australia. Dorothy Robinson was one of those quiet achievers. 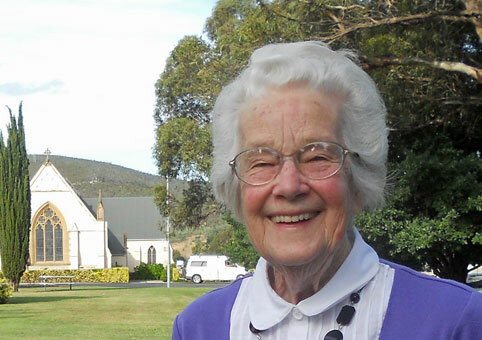 She gave great service to her home town of New Norfolk, primarily in the areas of local history, local government and the church, but also as a businesswoman in the greater Hobart area. Dorothy was born in New Norfolk in 1929, which was the same year that her father built the town’s biggest general store. It was well built and still stands, although it was converted to a supermarket decades ago and has changed hands several times. Having grown up in the town centre, with the municipal offices in the circle at the top of the main street, in 1956 Dorothy decided to seek election to the then New Norfolk Council (now Derwent Valley Council). Dorothy had become concerned about the recent problem of young men driving in an anti-social manner on the town’s Esplanade and her husband Bevan Robinson urged her to “stop complaining and do something about it”. “Doing something” meant seeking election in the local council’s Town Ward. Other women had sought election to the New Norfolk Council in the past, but none had yet succeeded. Dorothy stood against Councillor H.J. “Joe” Laskey, an icon in the district who had been in office for 17 years. That election saw the highest voter turnout in years – and Dorothy emerged victorious. The story of the 27-year-old mother’s victory made it into the pages of the Mercury. Winning election was one thing – gaining acceptance was another. The New Norfolk Warden’s Dinner was an annual tradition, attended by everyone of importance from the state premier down. The dinner was a male-only affair and following Dorothy’s election an invitation was sent to her husband to attend in her place. A kindergarten teacher prior to her marriage, Dorothy brought a new focus on family and children to the council table during her six years of municipal service. She had the honour of opening the forerunner of the present local swimming pool; helped to convert a boggy paddock into Ellis Dean Reserve; and worked for the establishment of a second kindergarten in the town. Her term in office came to an end when she moved house to establish a gladioli farm at Magra – still in the municipal area but outside the boundary of the Town Ward. Dorothy’s new venture, the gladioli farm, was a great success and became a supplier to Coles. Sadly the venture was dealt a fatal blow when the farm was burnt out in Tasmania’s bushfire disaster of 1967. Ever onward, Dorothy took over an established garden shop in Hobart, followed by another in suburban Glenorchy. A third shop in the chain was then established at New Norfolk. Flowers for the shops were grown in the back yard of the family home in Glenorchy. Dorothy and Bevan Robinson, the parents of seven children, ultimately retired to Ellendale where they celebrated 50 years of marriage. Dorothy returned to New Norfolk after being widowed, and embarked on a new era in her life. She joined the New Norfolk Historical Information Centre and started putting to good use her first-hand knowledge of so much of the town’s history. She penned many articles for books published by the committee, and was a key contributor to both volumes of The Derwent Valley: From Federation to Millennium. A chapter from one of those books was the genesis of Dorothy’s greatest literary work – A Glimpse into the History of St Matthew’s Anglican Church - a book of more than 80 pages on the history of Tasmania’s oldest church, built at New Norfolk in 1823. Dorothy was a faithful parishioner of the same church since her baptism there at four months of age in 1929. This major work was undertaken while Dorothy was undergoing treatment for cancer, from which she did not recover. Dorothy was also a member of the Retarded Children’s Welfare Association in New Norfolk, an original member of the Magra branch of the Country Women’s Association, and a past-president of the Derwent Valley Combined Probus Club. Some years ago, Dorothy contacted the Derwent Valley Council with an idea for a memorial to some of the founding families of the New Norfolk district. The idea lay in wait until funding became available, and on Australia Day 2013 the Tribute Wall at Arthur Square, New Norfolk, was unveiled by the then Federal Member for Lyons. Among those present were daughters of Joe Laskey, the councillor unseated by Dorothy nearly 60 years before, to see their family name recorded on the wall built at Dorothy’s instigation. Dorothy passed away last June, aged 85. Here's to you, Mrs Robinson. Indeed, here's to you Mrs Robinson! Such a dear and inspirational friend, she would've been so humbled but proud of this honour. A very deserving award recipient - a complete volunteer in everything she gave to this community. Many thanks to the nominator and the other referees, you have done her proud!